Spending time with students, visitors, and program participants in the Woodson Art Museum galleries is one of the most rewarding parts of my job. Finding ways to excite and intrigue students means getting creative. While sharing stories, trading observations, and considering new perspectives on familiar artworks helps me stay engaged throughout an exhibition, many students need more than conversation. In my experience, the popular writing adage “it’s better to show than tell” applies when developing content for guided gallery experiences. Cut Up/Cut Out easily captures students’ interest; the artworks showcase unexpected materials, dramatic scale, and eye-catching designs at every turn. 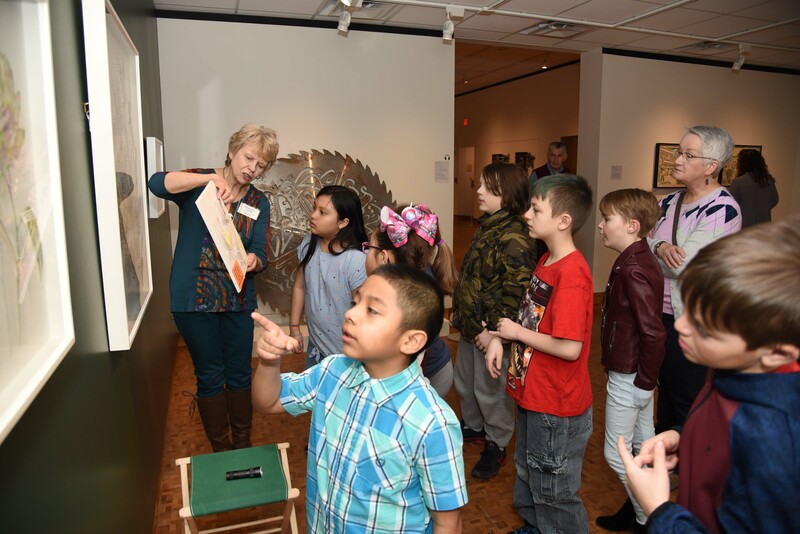 Sustaining students’ interest and focus during docent-led gallery visits meant developing interactive ways to illustrate educational themes and connect elements of art and design to the artistic concepts on view. With help from the Museum’s facilities team Dave Jones and Ralph Fisher and curator of exhibitions Shannon Pueschner, docents and staff have access to wonderful “tour props” this spring. I’m always proud of the interactive teaching tools we devise; it’s heartwarming to witness how effective they are in the hands of students and volunteer docents. We chat briefly about how Oates captures the busy, awkward nature of moving through public spaces and then we shift gears to talk about the visual elements of the artwork. Oates cuts a variety of figures from shades of white paper, stacking and overlapping them to compose a group portrait. 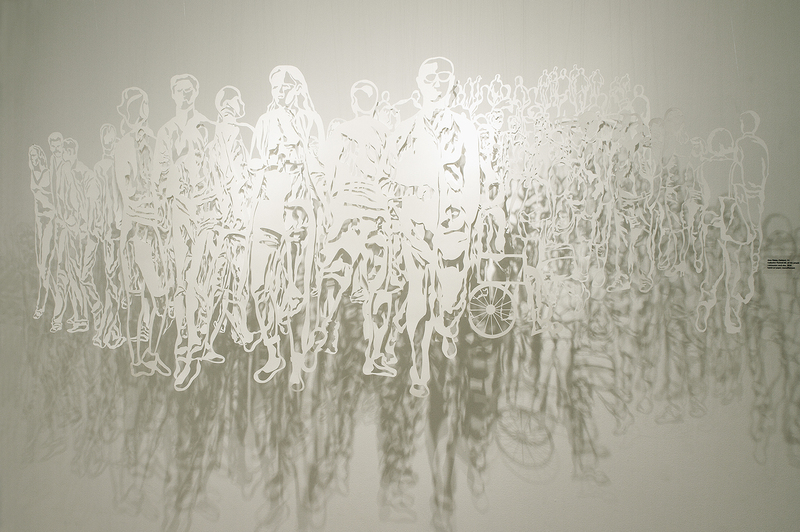 The sense of depth and density are heightened by cast shadows, which stretch below the hanging paper sculpture, echoing the frenzied but fleeting movements of the artist’s subjects. I believe that light and shadow function like collaborators with the artists in Cut Up/Cut Out. 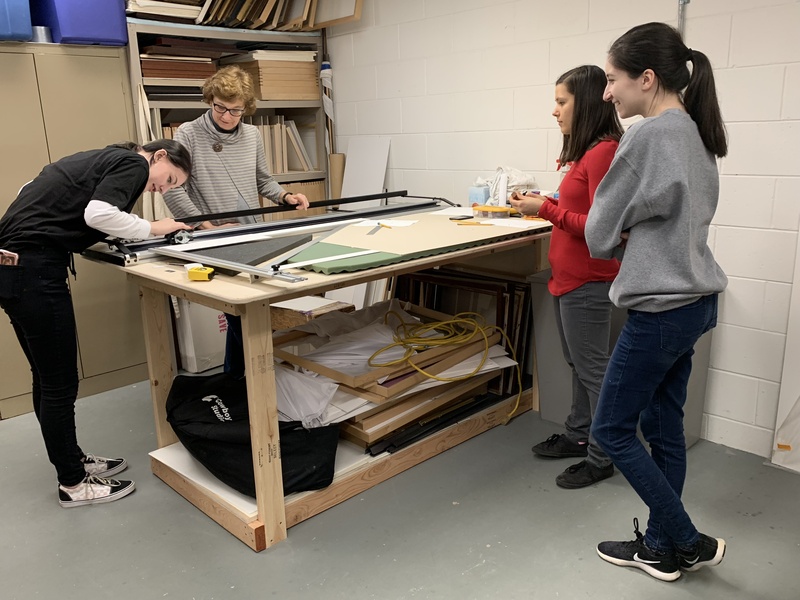 To show, rather than tell, students how powerful these elements are, we use a flashlight to manipulate layers of shadows cast by cut vinyl silhouettes on Plexiglas®. While six students hold up sheets of acrylic sporting botanical designs, a seventh student directs a flashlight through the layers of pattern while other students ask their friends to move the panels closer together or farther apart while changing the direction of the light to yield dramatic results. 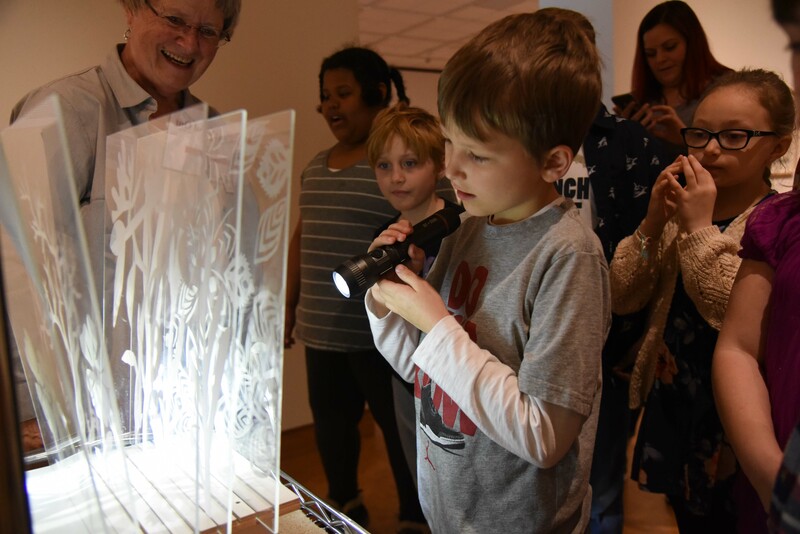 If space is limited in the galleries and a makeshift shadow theater against a wall isn’t an option, students can take turns moving the panels between different slots in a holder, observing how the changing angle of the flashlight manipulates the composition. Is this fun? Yes. Is it simple? Absolutely. Are adults intrigued by these interactive tour props in the galleries? Of course; who doesn’t like playing at the Museum? Exploring entertaining and accessible objects in the galleries is just one way to nurture student discoveries at the Woodson Art Museum. More robust collaborations with classroom educators can afford students even more meaningful connections with the Art Museum. Wausau East High School Art Department Chair Joel Pataconi is a regular partner with the Museum. You may have enjoyed the monochromatic, Op Art-inspired sculptures his Design Foundations students created following their visit to the Victor Vasarely exhibition this winter. 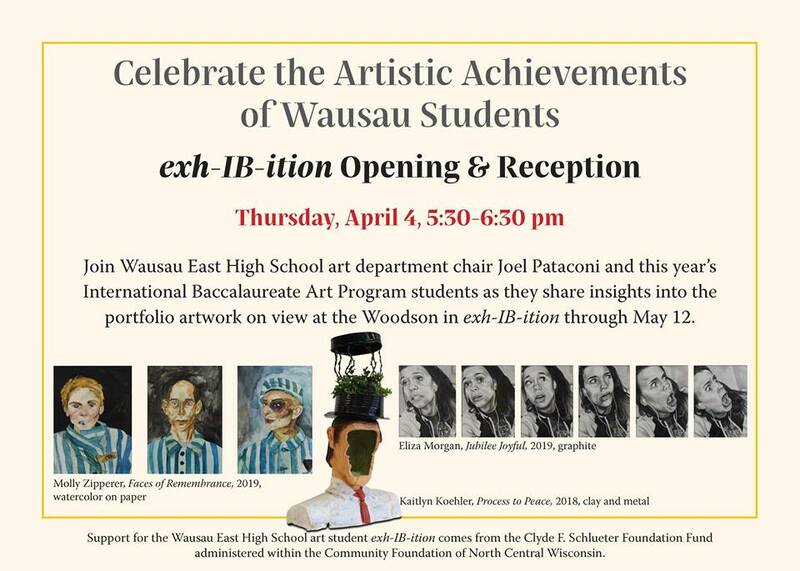 Thursday, April 4, Wausau East International Baccalaureate Art students will celebrate the opening of their exh-IB-ition and offer insights into their artworks during an Art 101 program, 5:30-6:30 pm. The three IB students began working with Museum staff members in January on the curatorial process of developing their exh-IB-ition. Curator of collections Jane Weinke offered a matting and framing workshop at the Museum. Assistant director Matt Foss, Shannon Pueschner, and I met with students as they began work on their artist statements while considering overarching themes of their portfolios. I invite you to visit this spring for a walk through the galleries, hands-on art making in Art Park, and to support the creative efforts of young area artists, who make the most of their experiences at our local Art Museum.